Takeaway: Want to grow a full-flavor tomato fruit? 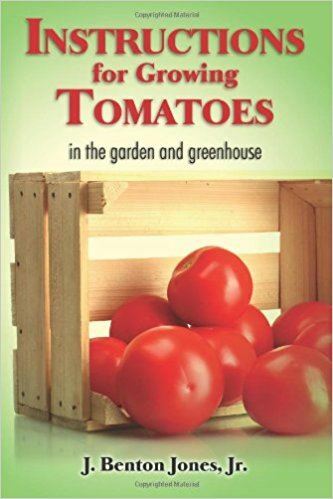 A new book from Dr. J. Benton Jones, Jr. called Instructions for Growing Tomatoes in the Garden and Greenhouse outlines how to do just that. If you're an avid reader of Maximum Yield magazine, you'll most certainly be familiar with the name Dr. J. Benton Jones, Jr. He's been an active contributor to the magazine for many years and always provides a welcomed ranged of scientifically sound articles. His newest book is available in soft cover through amazon.com and for electronic readers, and is dedicated to those who want to grow a juicy, full-flavor tomato fruit that is unblemished and cosmetically appealing. Also included in Instructions for Growing Tomatoes are the requirements for maximizing the number and weight of fruit produced, whether the tomato plant is to be grown in soil, an organic soilless mix or hydroponically. These instructions are based on proven practical experience and the latest technology by the author himself. Instructions for Growing Tomatoes is a basic text on tomato plant physiology, its fruiting habits and those factors that relate to high fruit yield and quality. But first, the book begins with a history lesson and a few random facts about tomatoes, which botanically are a fruit classed as a small berry having first originated in the coastal strip of South America in the 1500s. The reason they are classified as vegetables dates back to 1893, as J. Benton explain. The United States Supreme Court deemed tomatoes a vegetable so that they would fall under the Tariff Act and could be taxed as a vegetable. The court argued tomatos could be deemed a vegetable because they were mainly consumed during dinner alongside other vegetables, and not afterward as typical of many fruits for dessert. Now, tomatoes are one of the most common garden fruits (vegetables?) grown in the United States. Commercially the United States accounts for 35% of the world's tomato supply with California accounting for 90% of the country's production. Although they have several unique requirements and are not considered a hardy plant, the cycle of a tomato, from planting to market maturity, takes between just 50 to 65 days, slightly longer for late varieties. In subsequent chapters, J. Benton talks about tomato lighting requirements, major element requirements, micronutrient requirements and rooting media selection, with a whole lot of good-to-know information found in between. Separate sections of the book are dedicated to growing tomatoes outdoors vs. indoors, and at the end of it all, the author talks about his own experiences growing the fruits, which he started doing over 60 years ago. “During the summer of 1950, I successfully grew several tomato plants in a large sandbox using a home-made nutrient solution to supply the required plant nutrient elements. This supplied the family with plenty of fresh tomato fruit during the summer, and this began my interest in hydroponics, which has continued to this day,” J. Benton writes. As a highly experienced grower, J. Benton certainly knows what he is writing about and has penned several other books on the subject. He is willing to share full color copies of any of the images appearing in his books to readers who write to him and request them. If you've been growing tomatoes for some time and have some lingering questions about the process, Instructions for Growing Tomatoes will help answer them, or, if you're considering planting your very first seeds, this book is a great place to start and can be devoured in just a few hours. For more information, see hydrogrosystems.com and growtomatoes.com.